Welcome to Day 5! I hope you are enjoying the changes to our website! I think they should make these tutorials more readable and therefore easier to follow. Also, as I do these twice a week, I am learning how to format things better. So even as the code gets more complex, hopefully the organization will get simpler so that you never get lost! Today we will apply some of the concepts we covered in the previous lessons to add a scrolling background. In addition, we will be adjusting the movement so that it does not "stick" like it used to. Lastly, we will change the player's sprite (character image) depending on his actions. Inside this Background class, we will be doing the following. 1. Creating variables that we will be using to manipulate the background. 2. Defining a constructor (which allows us to create objects (instances) with the Background class (remember that classes are blueprints for objects. By instance we refer to an object that was created using a class and therefore has its properties). 3. Creating an update() method that will let us move the background. 4. Adding getters/setters (recall from Day 4 that getters/setters are helper methods that allow us to retrieve and manipulate private variables) that deal with the variables created in step 1. We will be creating bgX, bgY, and speedX. The first two of these represent the x and y coordinates of the background's upper left corner. We created a Robot object to represent our main character. In this case, each image that we piece together for the background will be represented by a Background object. The variables bgX, bgY and SpeedX that we defined above will now take the following values: x, y, and 0, respectively. This means that whatever two values that we feed the constructor in the StartingClass to create a Background object will become the values of bgX and bgY. We want the background to start static, so we give it a speed of zero. With each iteration of the game loop (it is every 17 milliseconds for our game), we need to do something with the background. In our game, the background will scroll when the character moves to the right (think Metal Slug). So we need to create an update() method that we will use to make changes to the background (such as its position and speed). 1. It should update the position. 2. If the background is no longer visible, it should either destroy itself (to free up memory) or be recycled by moving to a visible (or soon to be visible) location. Quick Note: One of the most frequent questions that beginner programmers ask is whether a method name is pre-defined by the Java Language or arbitrarily chosen by the programmer. In this case, since we are creating a new method that does not exist, update() is a name of our own choosing; however, if you refer to the StartingClass.java, none of the methods can have their names changed. This is because we are borrowing these methods from superclasses and interfaces. An easy way to tell is to see if @Override denotes the method. Override usually means "use this new definition of the method, not the pre-defined one in a superclass." When you create a method with Eclipse's help (using Ctrl + Space), READ the tool tip. It will often offer more insight. Quick Note #2: Be a thoughtful programmer. Think about how things work. Don't just take what I say and accept it without scrutiny. Try to conceptually understand why everything works the way it does. That is the only way you will get better to the point where you can make your own programs. If you have any questions, ask in the comments section. I love answering questions and explaining things in more depth. Okay. Now that you thought about the update() method, let's see what it does. bgX += speedX - this will change the bgX by the speed in the x direction. That makes sense. Now, the if statement: When the x coordinate of the background is at -2160 or below (it is no longer visible), we move it up by 4320 pixels (so that it can go 2160 pixels ahead of the currently visible image. If this is confusing, it will make more sense when we start running this code at the end). Question: Why does the if statement say: bgX <= -2160 and not bgX == - 2160? There is a very important reason. What is the smallest unit of change in X position? Can bgX change instantly from 2161 to 2159? If so, will the condition still be satisfied? This is easy. Eclipse does the work for us. 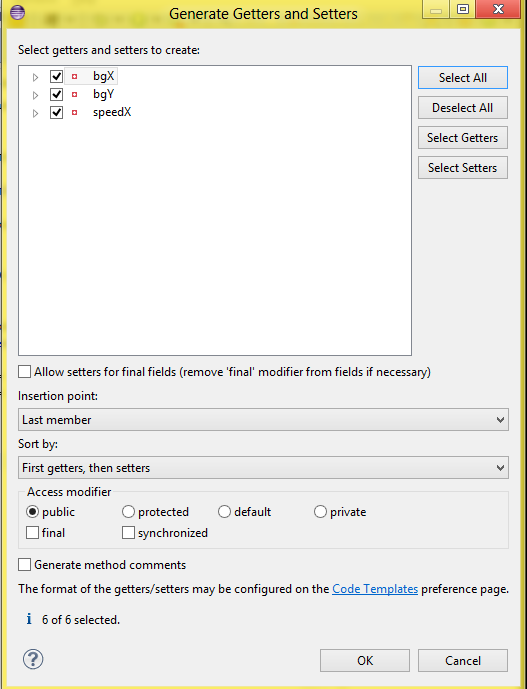 Right click in the code, select Source > Generate Getters and Setters. With the Background.java class complete, we can now add our two background images! We will be dealing with the StartingClass for this lesson, so open that up. 0. Create a class for it so that we have a blueprint for it. (We did this for our background). 1. Within the StartingClass, we must create objects using this class (first by declaring them as variables below the class declaration and second by assigning them values in the start() method). 2. Within the run() method, we must call the object's update() method. 3. We must paint the new object in the paint() method. Let's start with number 1 (we finished number 0 above). (We make them static so that we can create getters and setters for them to be used in othe classes for movement). This will create two new Background objects separate from each other that you can refer to as bg1 and bg2. Recall that we required two integer values as parameters in the Background constructor, so we feed it x, y coordinates for each newly created Background object. Images are painted in the order they appear. So if you want the character to be above the background, you need to put these two lines above the line that paints the character! As of now, whenever either left or right arrow key is released, the character will stop (even if the other one is held down). This makes for very uncomfortable movement and will not make our game a good one. The strategy to fixing this simple. We will keep boolean variables that keep track of whether each directional arrow is down, and when one is released, we will check if the other one is pressed before we stop or continue moving the opposite direction. Also, we will be allowing the character to duck, and will prevent movement while ducked. As I feel like all the changes I made to the Robot class can be understood when you examine them line by line, I will now paste the full Robot class here, instead of showing its creation step by step. If you have any specific questions, do let me know. // Moves Character or Scrolls Background accordingly. 1. I never talked about constants before, so let me spend a few minutes talking about them. Constants are types of variables. They just are variables that have permanent values. To indicate a constant, we just use the keyword final (which cannot be used as a variable name for this reason), and by convention (not law) we CAPITALIZE ITS NAME. Are three constants. Previously, I had these hard-coded, but creating constants for each of these values makes it easy to make changes to some of the basics of the game. In each location that I used -15, 5, and 382, I replaced the integers with these constants. 2. I replaced most of the System.out.println() placeholders with functional code. Where we previously indicated the background would scroll or stop, I added code that does exactly that. 3. The booleans are there to keep track of movement. Every time that you press a keyboard button, these booleans will change. When you are holding down a keyboard button, a boolean (movingLeft or movingRight) will keep track of that. For example: if I am holding down the left button (movingLeft == true) and I also press the right button (movingRight == true) and then release either one of those, previously the character would've stopped (as we would've called the stop method); however, now, it will check if either direction is still being held and choose from two possibilities: 1. stop the character if the other direction's button is not down. 2. if the other direction's button is down, move that way. 4. You will get errors in the StartingClass when you replace your Robot.java with the code above. We will fix these soon, so do not panic! This is because our character movement occurs here. To add some flavor to the game, I updated the look of our character and created two alternative sprites. Please download the three images and place them inside your data folder. Make sure you overwrite the existing character.png! "private Image image, currentSprite, character, characterDown, characterJumped, background;"
Note: Order of the declaration does not matter, but I like to organize them. What is currentSprite, you ask? At the present, we are painting the Robot robot (Robot object named robot) with the image character, but we now want to paint currentSprite, which will dynamically change to character, characterDown or characterJumped according to what the Robot robot is doing. These changes will check the current state of the robot and make necessary changes to currentSprite. That should fix all the problems in your code. They will let us retrieve the variables bg1 and bg2 for use in other classes. That's it for Day 5! I hope that you guys learned a lot and that I did not proceed too quickly. Thank you for reading my tutorials and supporting Kilobolt Studios!